With two months still left in the year, The Walt Disney Studios has posted its biggest year ever at the global box office with $5.85 billion through Nov. 1, surpassing the Studios’ previous calendar-year record of $5,843.8M set in 2015. Disney’s 2016 global record comes on the heels of a powerful $87.7M international opening for Marvel’s Doctor Strange, which is now at $110.1M internationally and which makes its domestic debut November 4. Still to come this year are Walt Disney Animation Studios’ Moana on November 23 and Lucasfilm’s Rogue One: A Star Wars Story on December 16. Captain America: Civil War (Marvel Studios) has earned $1.15B globally ($408.1M domestic, $744.7M international). It is the #1 film of the year internationally and globally and #2 domestically. 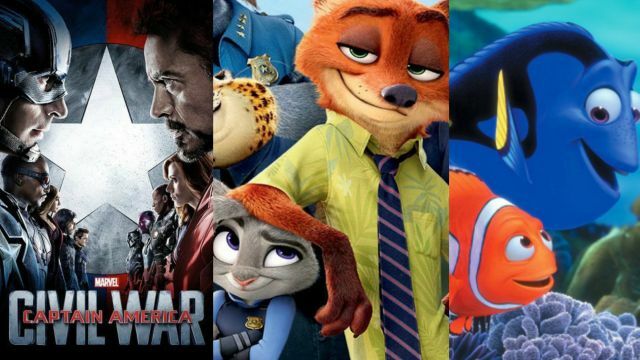 Zootopia (Walt Disney Animation Studios) has earned $1.023B globally ($341.3M domestic, $682.3M international). It is currently the #2 film of the year internationally and globally. Finding Dory (Pixar Animation Studios) has earned $1.022B globally ($485.7M domestic, $536.1M international). Still in release, it is the #1 film of the year domestically and the #7 domestic release of all time. It is currently the #3 film of the year globally. The Jungle Book (Disney Live Action) has earned $966M globally ($364.0M domestic, $602.3M international). It is the #3 film of the year internationally and the #4 film of the year globally and domestically. Star Wars: The Force Awakens (Lucasfilm), which debuted in December 2015, brought in $736.6M of its $2.068B global total in 2016. Its 2016 box office alone would rank it among the top 10 films of the year. The five films above, representing all five of Disney’s major film brands, have an average Rotten Tomatoes score of 94% and uniform A CinemaScores from audiences. The upcoming Doctor Strange is also Certified Fresh with a 90% Rotten Tomatoes score.